The World Tableware 840-438R-10 round dinner plate is part of the Porcelana series. 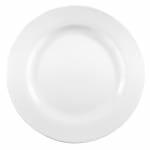 This dinner plate is 101⁄2 inches wide, and is made out of a durable porcelain that is suitable for commercial use and dishwasher safe to make cleaning simple. The rolled rim adds to the plate's durability and prevents chipping. The bright white finish and wide rim combine for an elegant appearance that will be a great addition to any restaurant's dinner service. Overall Dimensions: 11⁄8 in. H x 101⁄2 in. dia.